The cake itself has an eight-inch tier on the bottom and a six-inch tier on top. Each tier is about four inches tall with four layers of vanilla cake (colored pink, of course!) and vanilla frosting in each tier. I coated each tier with a layer of buttercream frosting and covered them with white fondant. Several people have asked me what I use for fondant, so if you're wondering, I typically just buy Wilton rolled fondant (from Walmart or Amazon -- usually cheaper at Walmart) or Satin Ice vanilla fondant from Amazon. For me, it is much easier and quicker than making my own. 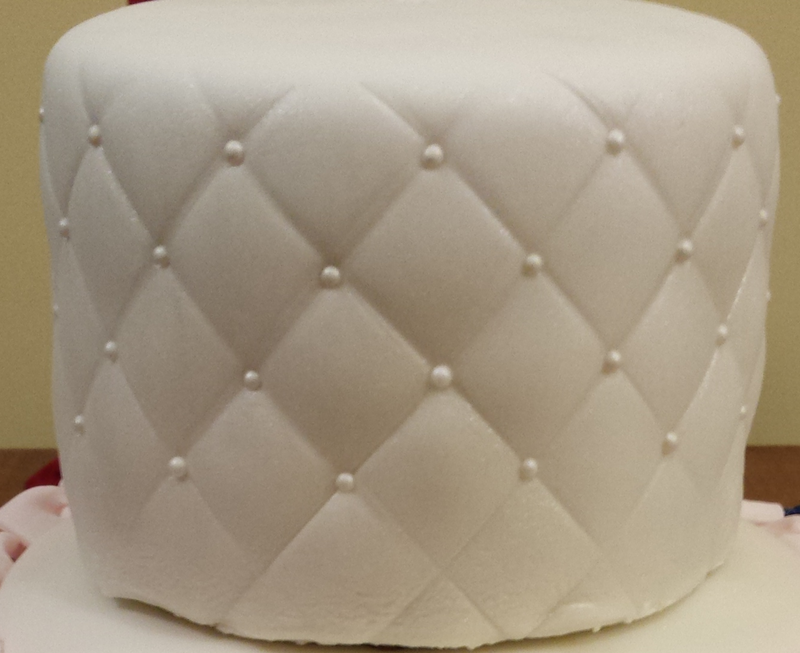 I started by covering the top tier with white fondant. 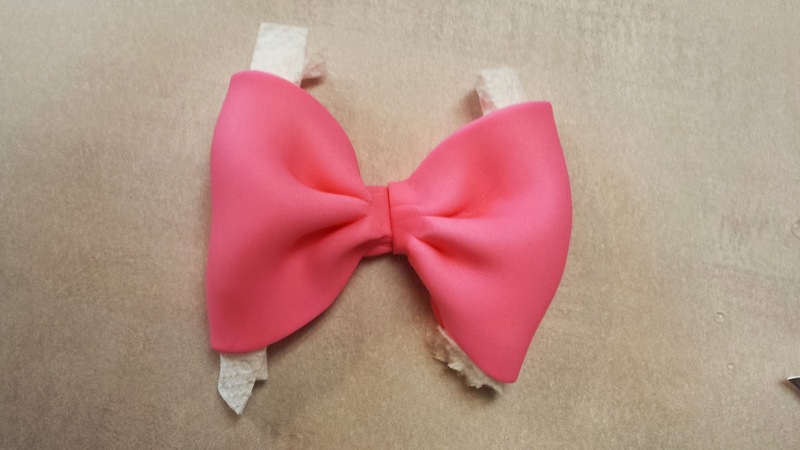 I wasn't worried about the bottom edge being perfect because I knew that it would be covered by the ribbon/bow. Next, I used a quilting tool to create the lines. I have used a rectangular piece of cardboard and a knife/pizza cutter to create a quilted effect in the past, but this tool was much quicker to use. After the lines were in place, I added some sugar pearls where the lines intersected (no pearls are needed on the bottom inch, since that section will be covered), then I set the top tier aside. I should mention that it is easiest to make the quilted lines immediately after you cover the cake with fondant, while it is still easy to mold. If you wait too long, the quilting tool can cause the fondant to crack and it doesn't look good (trust me, I know). Next, I covered the bottom tier with white fondant (you don't have to worry at all about how this part looks, since it will end up being covered by the ruffles). Then I used rose-colored food coloring to create the darkest ruffle color, and created the bottom row of ruffles. A few people have asked for directions for making the ruffles, so I took some photos that will hopefully help me to explain the process. 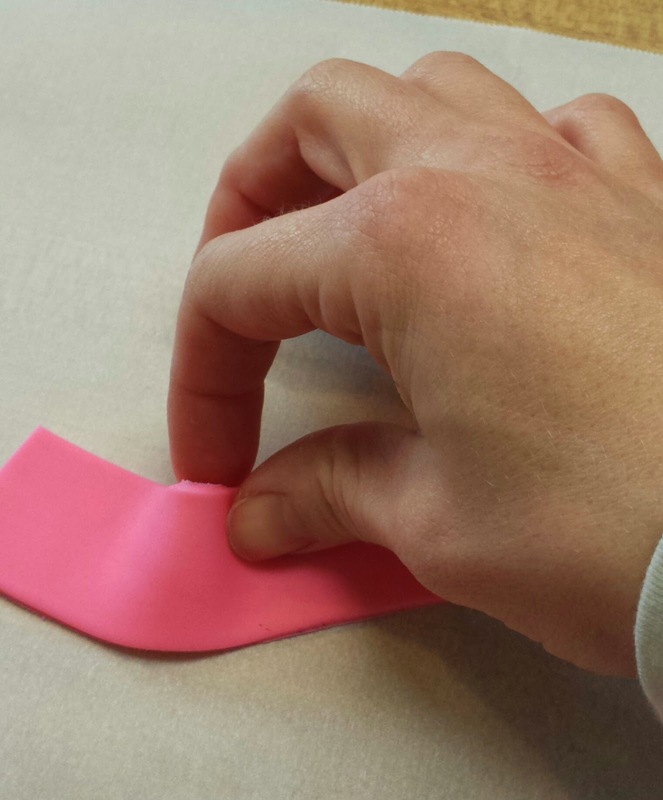 Roll a strip of fondant to your desired level of thickness. Initially, I rolled my fondant really thin, and it didn't hold the shape as well, so I ended up making it a little bit thicker. 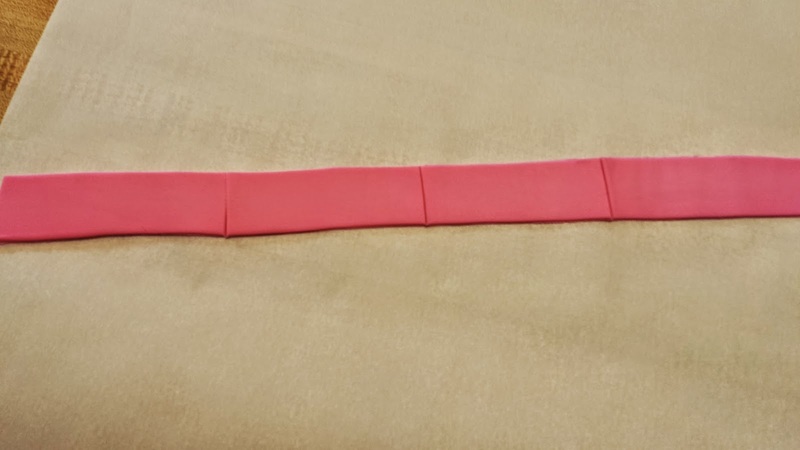 Cut a long strip of fondant (length doesn't matter right now) that is about one inch wide. Cut the strip into smaller sections (mine were about 3 inches). 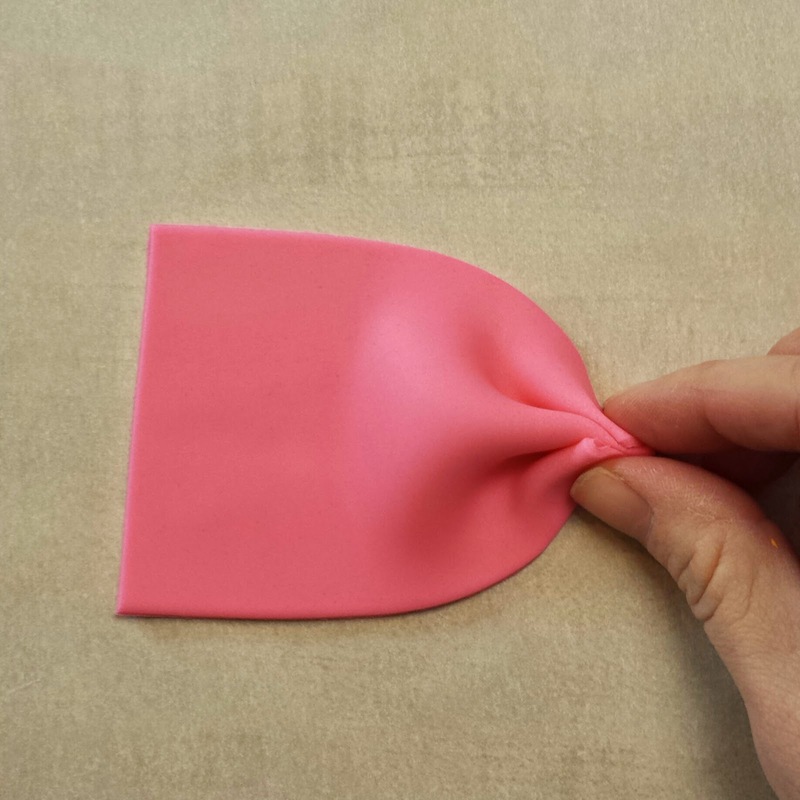 To create the pleats, use your finger and thumbs to create three pleats (or more, if you want) in each strip. Pinch the pleats together at the top. 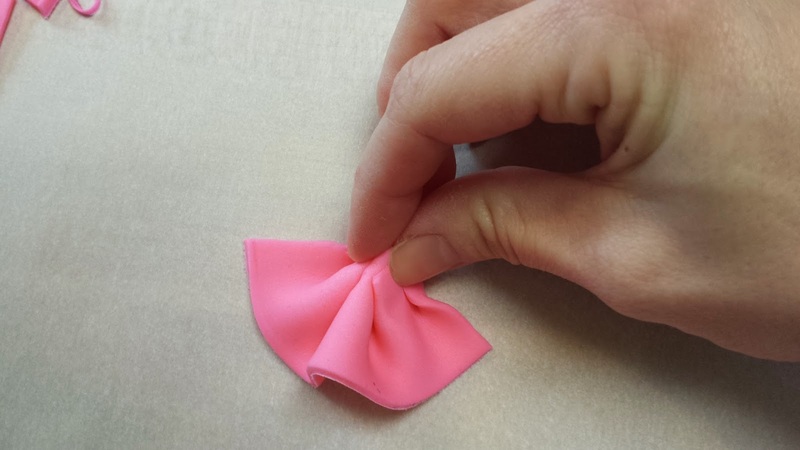 Cut off the excess pinched portion at the top of the ruffle so that the ruffle is flat on top. Now create as many ruffles as you need to cover the bottom row of your cake. Then use water, piping gel, edible glue, or frosting to attach your ruffles to your cake (I used piping gel mixed with a little bit of water). To create the next row of ruffles, I used the remaining dark pink fondant and mixed it with an equal amount of white fondant, then I did the same thing for the following rows (using the fondant from the previous row and mixing it with an equal amount of white fondant). After all of the ruffles were attached, I added some dowels to support the top tier, and then I set the top tier on top of the bottom tier. I pushed a long dowel down through the top of the cake (don't worry about the hole... we'll cover it up later). 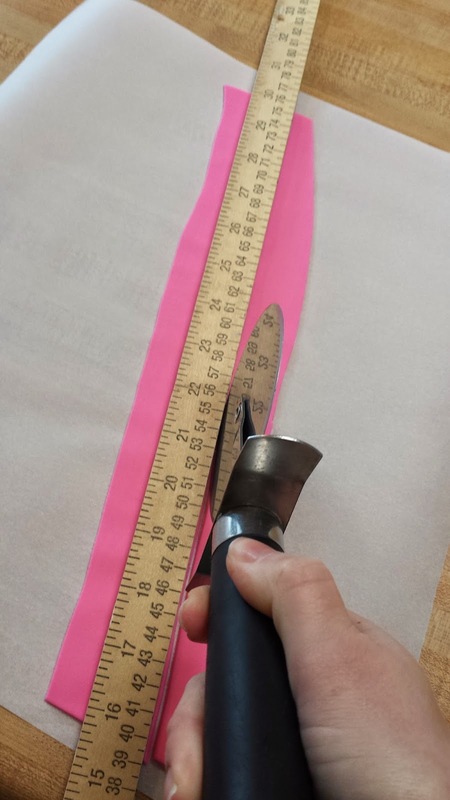 I used my yardstick to cut a long strip -- about 19 inches, since circumference = π (3.14) x diameter (6 inches), which equals 18.84 inches (and my students think that no one ever uses math in real life). Then I attached the strip to the base of the top tier to create the ribbon border. 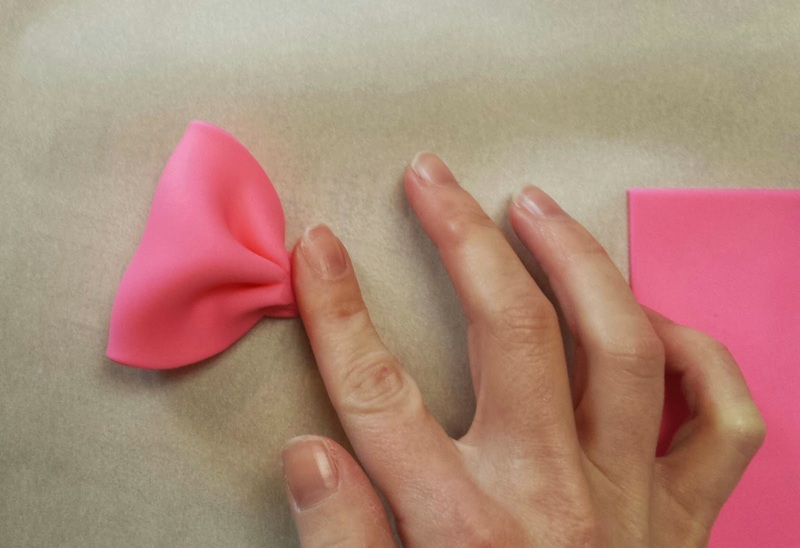 Take one section, and create three pleats using your thumbs and index fingers. Then pinch the pleats. Do the same thing to the other side of the section so that both sides are pleated. Flip this section over and add some "glue" (water, piping gel, etc.) to one side. Then fold it in half, pressing the pleats from each side together. 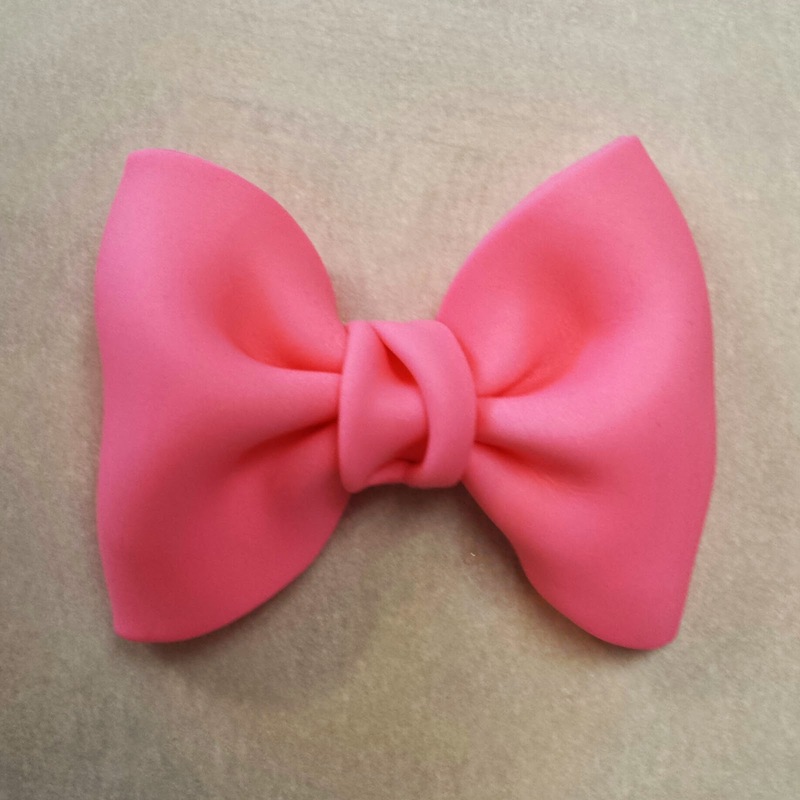 Take the other rectangular piece of fondant and create the other half of the bow in the same manner. 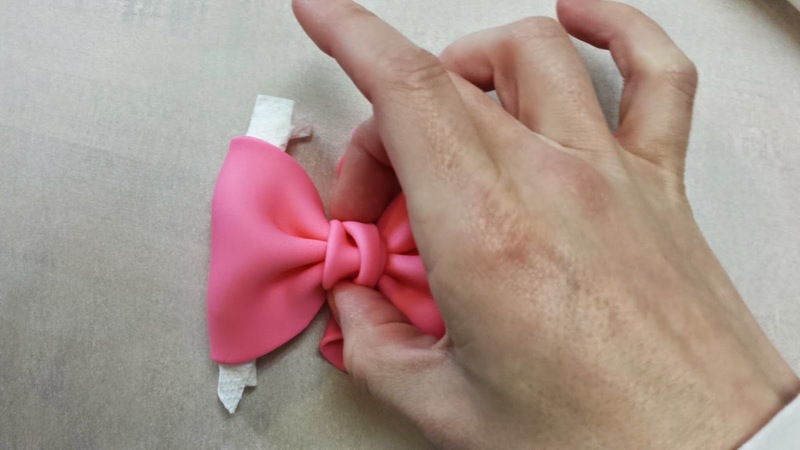 Use rolled pieces of paper towel to make the bow as full as you want it to be. 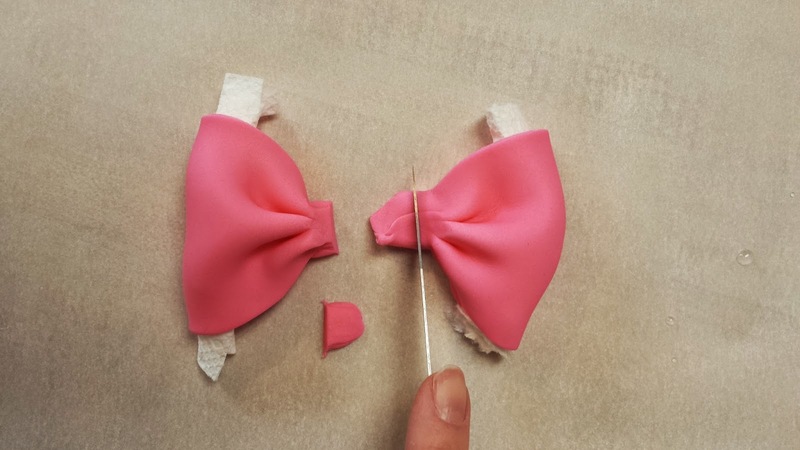 Then cut away the excess pieces from each half of the bow, and glue the halves together. 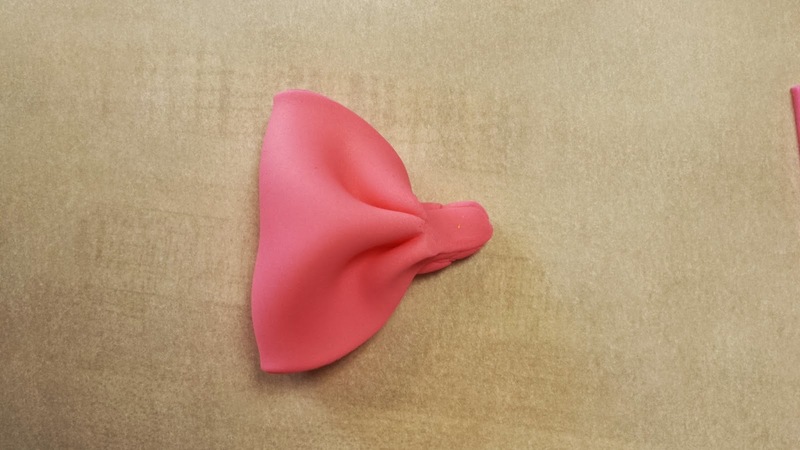 Roll out a small piece of fondant to create the center of the bow (it doesn't have to be very neat). 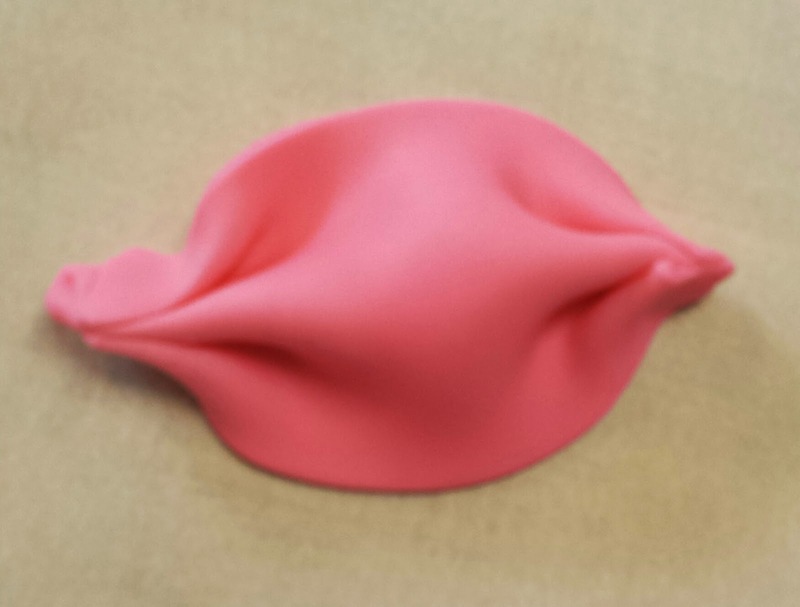 Then fold the edges over to make it moderately straight. Turn it over and pinch both ends together. 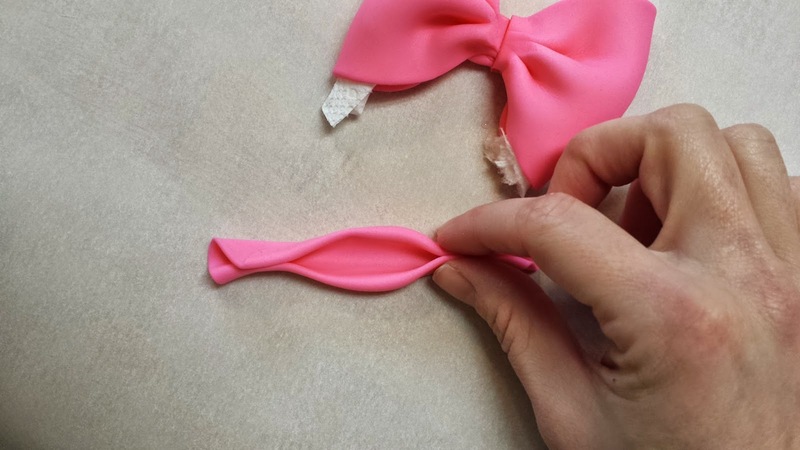 Then add some glue to the middle of your bow and place this piece onto the center of the bow. Cut away the excess. At this point, you can either add the bow directly to your cake, or you can wait a couple of hours for it to firm up a bit. Once it seems stable, remove the paper towel and admire your hard work. Okay, so maybe it wasn't super hard work, but it still looks nice, right? The top of the cake is the easiest part... probably because I didn't end up having to make a tiara out of fondant/gumpaste this time. 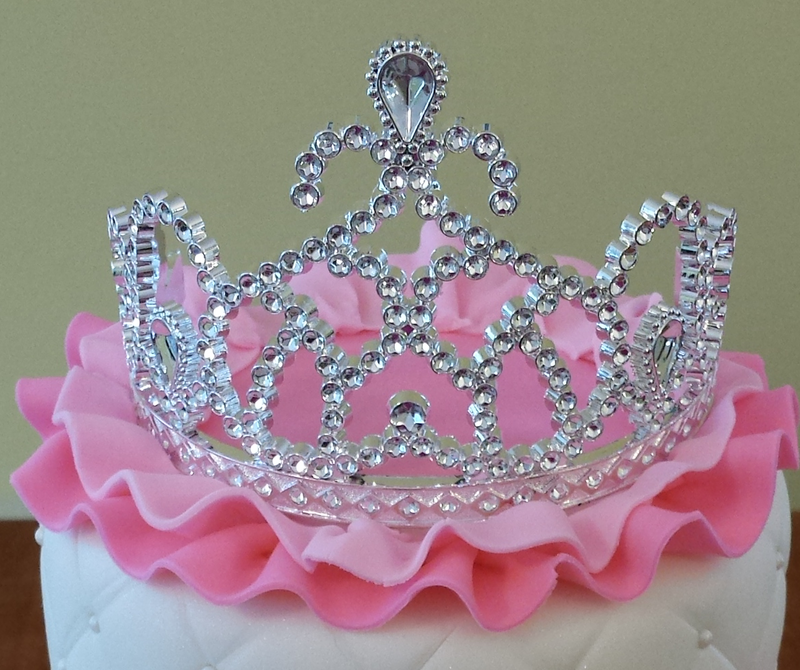 I bought this tiara from Amazon for a couple of dollars, and it happened to fit perfectly on top of this six-inch tier (I just cut off the hair picks). 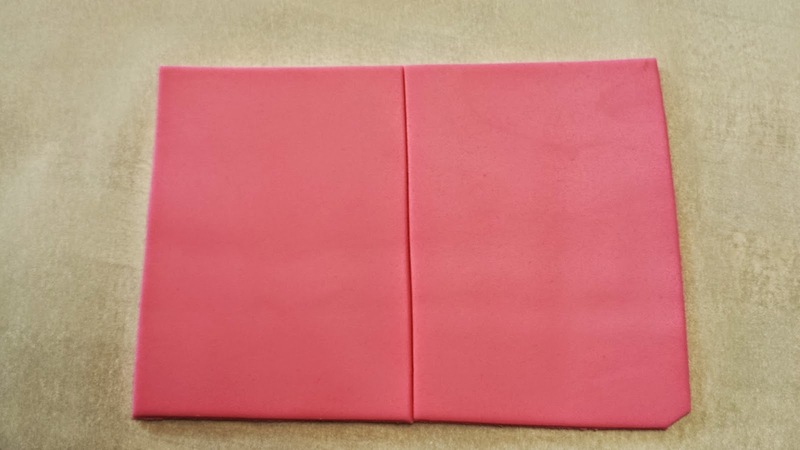 To cover the top of this cake, I rolled out a piece of dark pink fondant and cut it into a five-ish inch circle. Then I attached the circle to the top of the cake (which covered the hole that I made with the dowel). 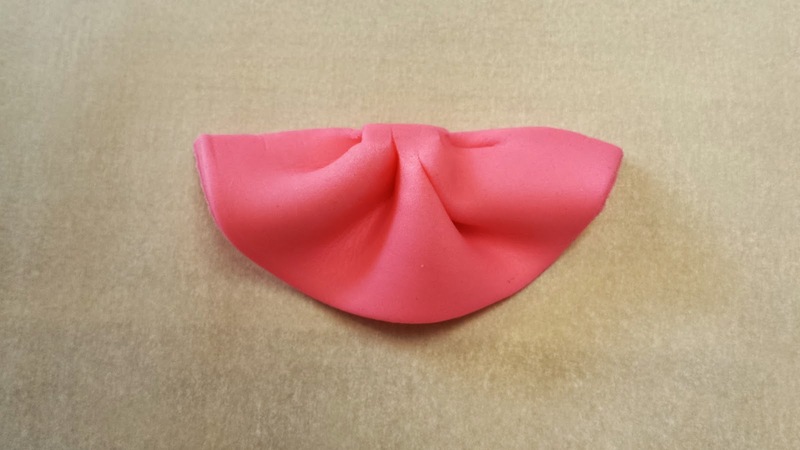 Next, I rolled out a long, thin, one-inch-wide strip of fondant to create the ruffle. I attached it to the circle, bunching it up as I went along. 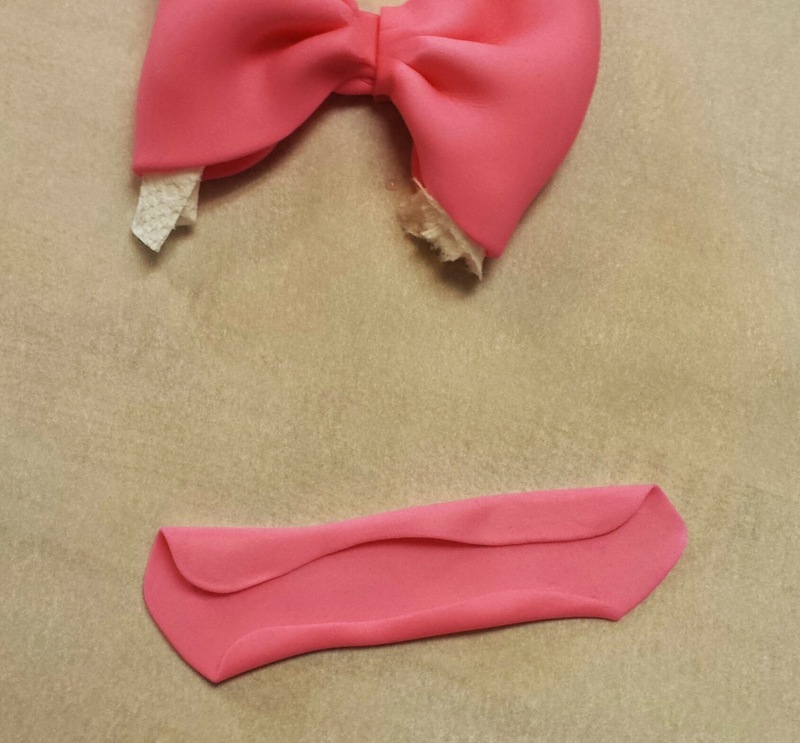 Then I did the same thing with a lighter pink strip of fondant. Lastly, I added the tiara, and voila! We're done! This is fantastic. After reading this I feel like I could actually do it and I could understand all the steps. Well done! Lindo trabalho, obrigada por compartilhar!!! Beautiful cake and Great step by step instructions!! Also makes me feel like I can do it! absolutely adorable and thank you for your patience of putting together such a wonderful tutorial! there is someone on fb posting this tutorial as theirs. this is the page: https://www.facebook.com/MyMixedBlessings is sharing posts by querido refugio. Thanks for letting me know. It's unfortunate that she promoted my work as her own and didn't provide a link to my site, but I put this tutorial out here for people to use in whatever ways they can... not that I am promoting plagiarism, but I'm hopeful that someone will be able to use this tutorial in some way, even if I don't get credit for creating it. Beautiful, Such a great tutorial! how many dowels total? and did you all into the cake before or after putting the top layer on? I'm making this cake for my granddaughter for her 6th birthday. Thank you so much for sharing. This is the first cake like this I am about to make. Beautiful cake! Thanks for the tutorial! Can you remember how many of each color ruffle you made to cover the bottom cake? Thank you! It didn't take too many for each row of ruffles. I don't remember exactly how many... twelve, maybe. I love this cake and want to attempt it for my daughter's birthday. 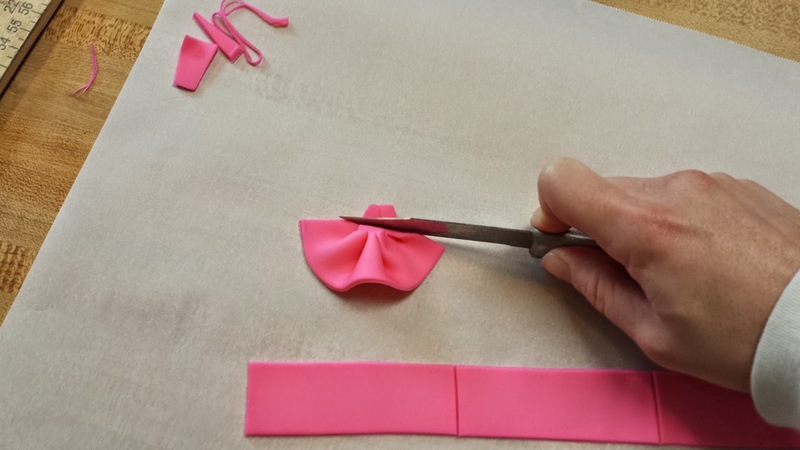 I know I'm late commenting but do you think it's possible to make the bow and ruffles ahead of time and allow them to dry before attaching to the cake? I'm trying to figure out how much of this I can do before the assembly of the cake. Would you still suggest using piping get to attach the dried pieces to the fondant on the cake? Thanks for your advice! How much fondant did you use for this cake?? 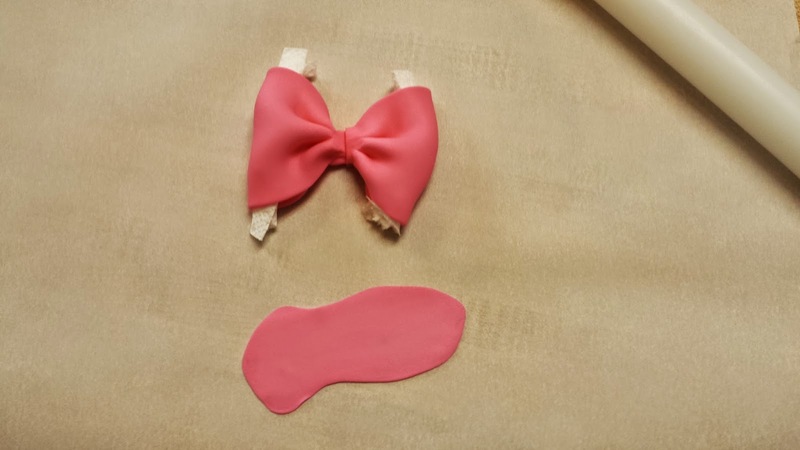 How much of the fondant did you color dark pink??? You could definitely make the bow ahead of time, and probably the ruffles, too. The only advantage of attaching them before they dry is that you can tweak the size if they don't fit perfectly. Piping gel works really well for attaching fondant, but if it is dry and it doesn't fit snugly against the cake, then frosting or melted chocolate might work better. I don't remember exactly how much fondant I used, but I started with a five-pound box of Wilton fondant (which comes with two 2.5 lb. packages). I used one package to cover both tiers with white and I think that I colored about a quarter of the second package dark pink. The bottom tier is 8 inches and the top tier is 6 inches. Both tiers are a little over 4 inches tall. Typically what is the cost to make this cake? I ended up buying fondant instead of making it, which might have cost less, so I think I spent just under $20 just on fondant. I used two cake mixes for the bottom tier and one for the top tier ($3) and two cans of frosting ($3), so in all I probably spent around $25. This cake is stunning, and I am seriously considering attempting something similar for my daughter's 4th Birthday in November! I did want to ask, how realistic do you think it would be for someone who has never used fondant before to create this cake? I haven't yet ventured into using fondant, so am a little worried to attempt. I have taken buttercream decorating classes, and would consider myself to be quite skilled in that area. I think that the bottom tier would be easy, since you'll be covering it up with ruffles. 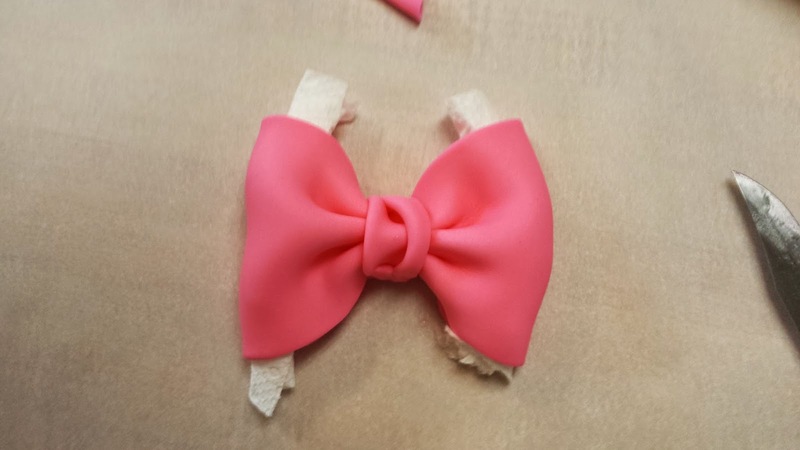 The top tier would probably be a little bit more difficult because there's less room for error, but I have found that the hardest/worst looking part when working with fondant is around the base (which is why I covered the base of my top tier with a strip of pink fondant). Pre-made fondant is pretty user friendly, so I think a beginner could make this cake. I have had a request to make this cake for a customer and was wondering if you had any objections. Thanks. Just wanted to say Thank you, this is beautiful creative work. Thank you so much for your detailed instructions and the time you put into them. I attempted the cake yesterday. I had never worked with fondant before so it took me 6 tries to cover the top tier, but i finaaly got it. My ruffles didnt come out like ypurs exactly, but it worked. I was trying to send you a picture, but don't see how to attach one...thank you again, and to all the beginners...you can do it if you just follow the instructions. Have a great day! I cannot wait to make this for my daughter's 4th birthday party. Couple questions: I prefer modeling chocolate over fondant. Do you think this could be made with modeling chocolate instead? If it will turn out better with the fondant though, do you prefer the Wilton or Satin Ice? I've read all the comments on Amazon and it seems the Wilton is easier to work with (the Satin Ice is sticky?) but the taste isn't the best. Would love to hear your thoughts! Thank you very much for sharing your tips and instructions for this very beautiful cake. As a cake dec myself, it's not often you share your tips for the simple fact as someone mentioned earlier that people seem to feel they have the right to claim it as their own. Thank you very very much for sharing however your work is lovely and enjoyed by those who have a genuine appreciate for the effort and hours that goes into these cakes! I've always made my cakes from scratch. I've also never used fondant. Do u think its possible for me to make a cake like this? I've been baking for over 30 years but I'm terrified of taking chances or messing up. Lacey, do you think the ruffles would adhere to the cake well enough if I used buttercream icing to cover the cake instead of the fondant? I don't work with buttercream often, but I'm guessing that the ruffles might be a little bit too heavy for the buttercream. I've seen some cool buttercream ruffle tutorials, though! Lacey, I saw this cake and thought, "Oh, if only there were a tutorial". Then, to my joy, I read your complete tutorial on the cake and I can't thank you enough for sharing. It's one thing to create and be a creative individual, it's another thing to share and teach other's how to recreate your vision. 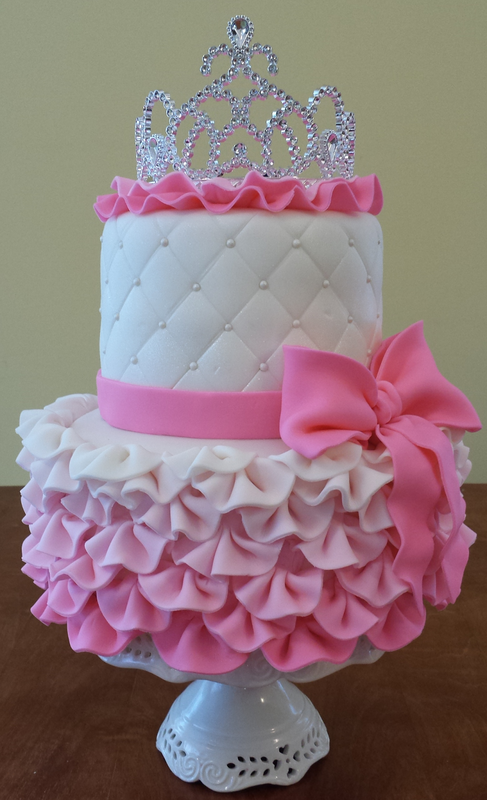 I am going to make this cake for my daughter's 7th birthday and I have never made ruffles with fondant before. Thanks to your tutorial, I feel confidant that I can make this cake beautiful! Thank you so much for the wonderful step by step instructions! Your cakes as well as your tutorials are just amazing!! Is it ok if I do this cake for a customer? Can I get your permission please? Hi there! this cake is so cute. A friend of mine asked if I could make this cake for her baby's 1st birthday. I told her yes, and I'm glad I found your tutorial. Your instructions are very thorough. I do have one question. Is it ok to make the ruffles about 2 weeks in advance and store them in a container? Your cake is beautiful! I am going to try to attempt to make it for my girl's 10th birthday. I am new to making cakes so I have a beginner question. You stated above that you used, "two cans of frosting." Can I use just the regular buttercream frosting in the baking isle at the grocery store or do I need some other type of buttercream frosting? One more question. 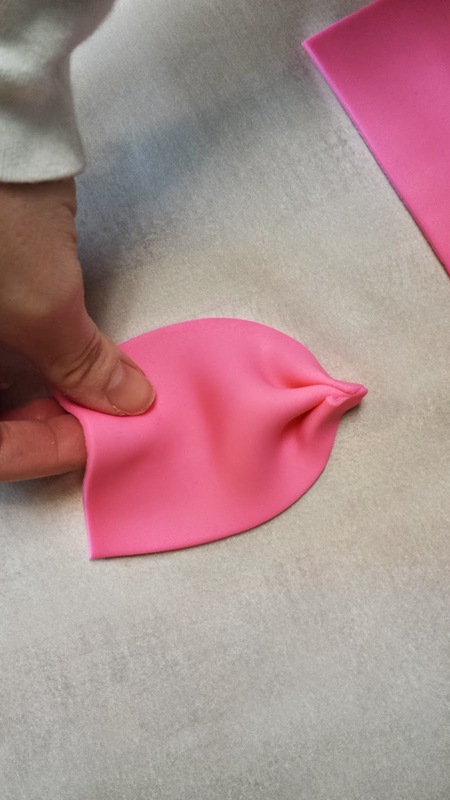 What did you use, and how much, to get the white fondant to turn to dark pink fondant? Thanks. I used store-bought frosting from the grocery store, and I think I used Wilton's rose pink gel food coloring in my fondant, but I don't remember exactly how much I used. Yes, I do. I usually sharpen one end of the dowel and then push it down through from the top. Beautiful cake. Thanks for sharing. How far in advance can it be made? Thank you! I usually make cakes up to three days in advance, but you could definitely make the ruffles weeks in advance, if you want to. The great thing about fondant is that it can keep for months in a container, out of direct sunlight. Such a beautiful cake, typical "girly"
Tutorial is very informative and love the way you did the bow..
Will definitely save for future use. Your tutorial was amazing and a huge help! I made this cake last night and shared your blog on a cake decorating group and the ladies loved it! Thank you so much for sharing !! does the ruffles stay on the cake if i transport it.. i to will use piping gel with water.. but was curious if it will keep the ruffles on the cake. 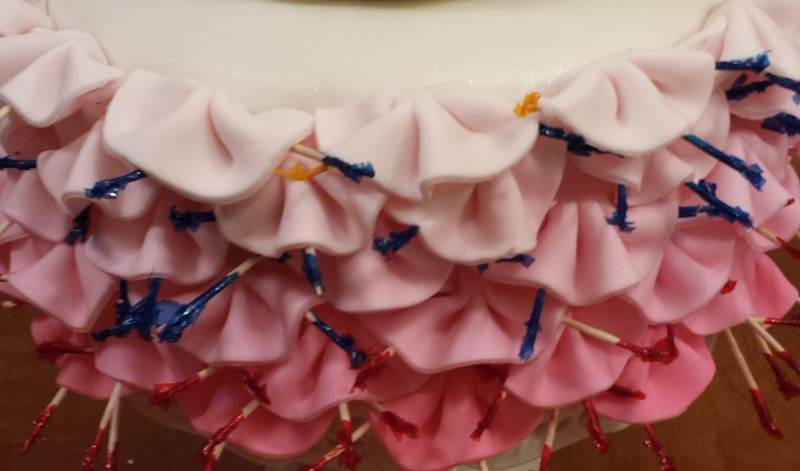 The ruffles should definitely stay in place if you're using piping gel/water. This cake survived a 30-minute car ride, after I let the ruffles harden onto the cake overnight. Following your tutorial I made this cake for a client's baby shower (I was an at home baker) and I can tell you of all the cakes I have made this is EVERYONES favorite! I was sure to link back and give you credit for this marvelous tutorial. Thank You for sharing your gift with us all. Oh and to answer someonese question above by far the best way to get the colors you want without the nasty taste that is often associated with Wilton coloring is to use Americolor instead. I get vibrant red and black even with absolutely no taste even when dying Marshmallow Fondant. Beautiful cake. Can you please tell me how many people will this cake be enough for? Thank you. It should feed between 20 and 25 people. This is such a cute cake, thankyou for taking the time to share. Would it be ok if I recreated it? Also, how long did it take you? Thank you. You are more than welcome to recreate it. :-) I don't remember how long it took, but I remember that the ruffles seemed to take forever! This cake is very cute! I also wanted to remake this, but with the bottom tier being 12 and top tier being 10. 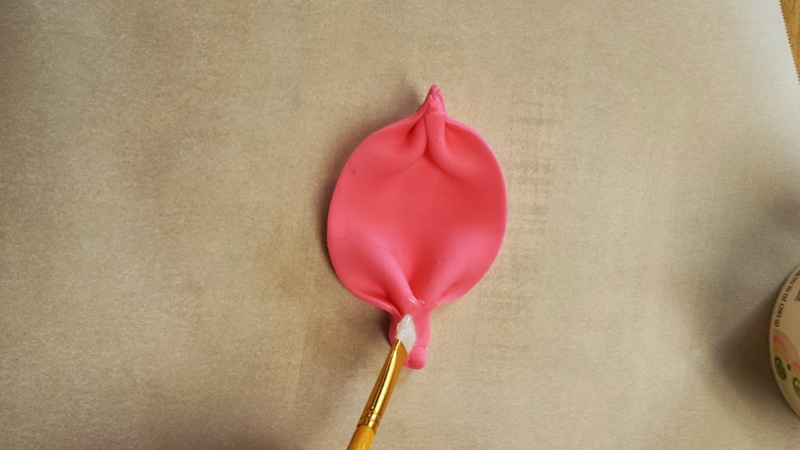 Have you recreated this with the these size pans and did it look alright? Also, the pans you used- were they 2 inches deep or 3 inches deep? 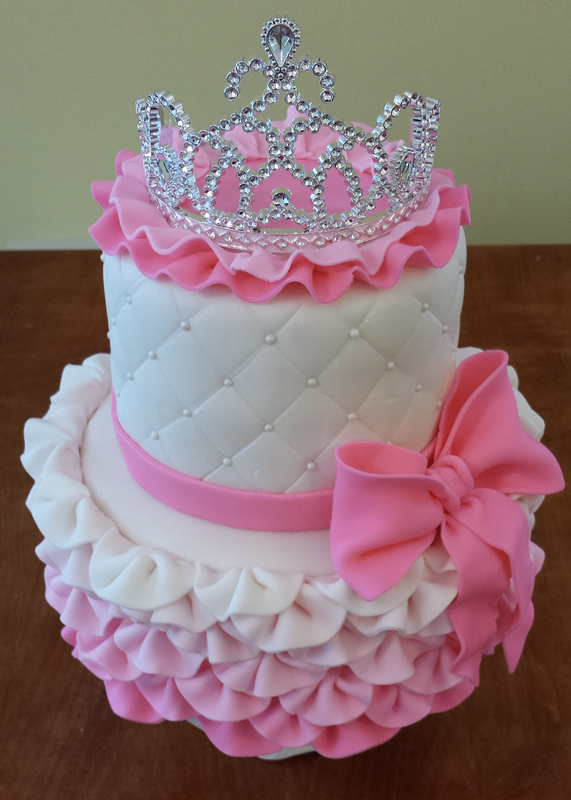 I haven't tried making this cake in any other size, but I'm sure it will look fine as long as the crown fits. :-) The pans I used for this cake were two inches deep. 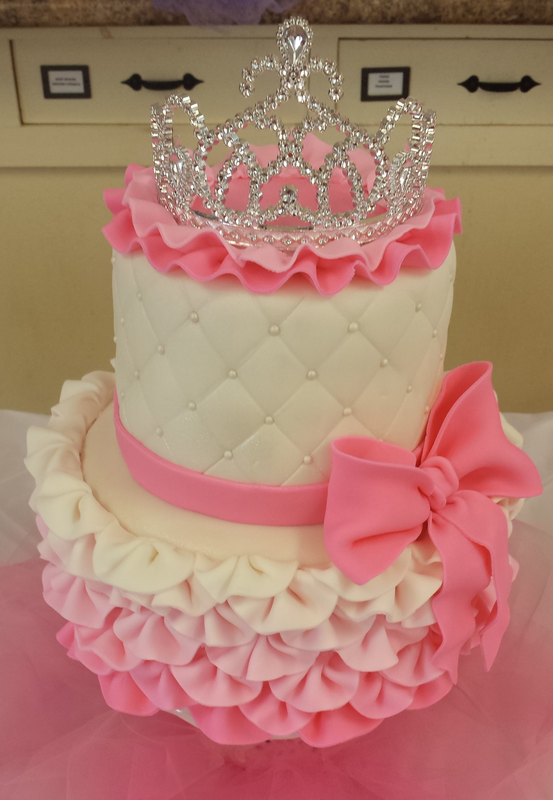 I just made this cake for a client wanting a Princess cake. It came out just so gorgeous! Thank you for making it so easy to follow. My cake was such a hit!!!! I'm about to attempt this cake for a girlfriends baby's first birthday.. I read all of the comments hoping to find a question about the measurements for the two rectangles used for the bows.. I know this tutorial is a bit old now, any estimate you can recall? I haven't made a lot of fondant cakes so the most help I can get, the better! Thanks for posting this tutorial, I'm so excited to attempt it! It's Such a Unique Idea to impress my Princess and I really love this blog, Its great to find not absolutely everyone is just posting a ton of rubbish these days!. and i Wanna tell you one think if need any one Birthday Cakes delivery in UAE, Dubai & any Other Country so ferns N petals helps You. wow. So beautiful. Maybe you can wrapping it with ribbon either. Looks amazing! Thank you for your post! I am going to attempt this for my daughter's 4th birthday this week. Fingers crossed it comes out similar to yours! thank you for the beautiful tutorial. Can you tell me what stand you have the cake on and where I might be able to purchase it? It doesn't look like your run of the mill stand. 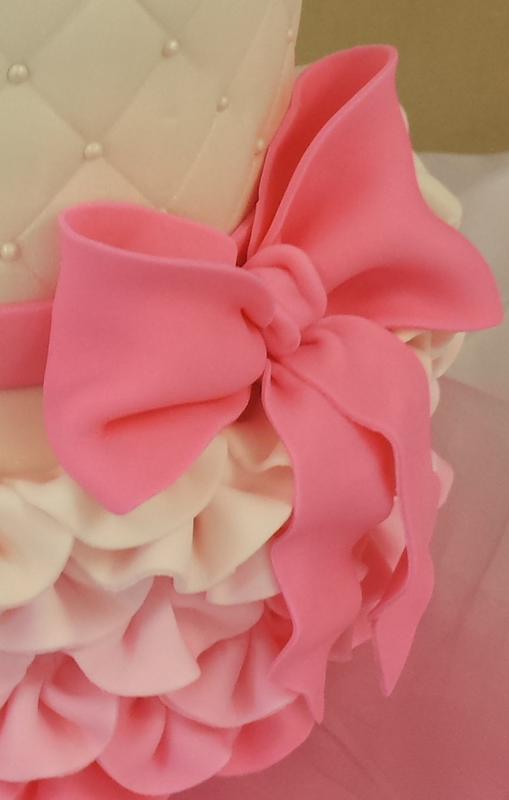 The frills of the cake sit over the stand beautifully. I think I paid $16 for it, but now it is listed for $43, so you could probably find it cheaper somewhere else. muchísimas gracias por compartir. Bendiciones a ti y tu familia. Me pidieron este pastel para el próximo sábado, tenía mis dudas en cuanto a la decoración así que me puse a buscar en internet y di con tu tutorial, después de eso estoy segura de poder hacerlo sin problemas. Ya que la clienta me dijo lo quiero igualito solo que más grande 😊 gracias de nuevo. Saludos cordiales desde Tijuana baja California México. Wow, these techniques are really simple and the end result is so beautiful. Thankyou for sharing. All the blog post are looking nice. Thanks for sharing. Nice recipes and so beautifully decorated cake. I love the style you made those flowers. I am surely gonna try them out.